I wrote : "the place of the post-gig festivities" but meant the pre-gig festivities. The place of any post-gig festivities won't be much farther away. 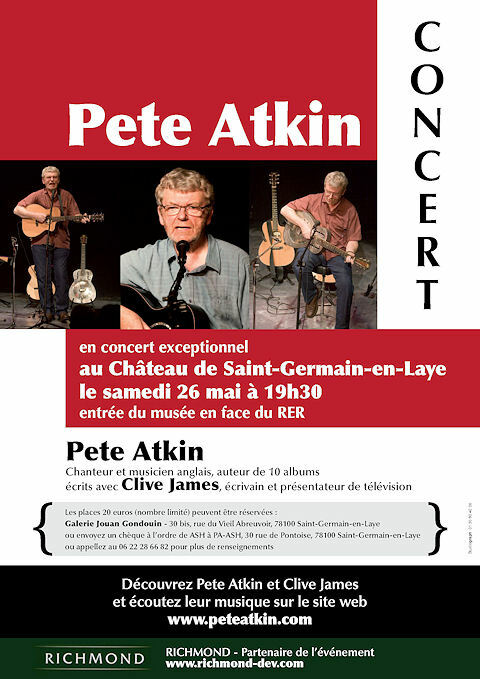 - The concert is set for 26 May at 19h30 in the Chateau de Saint-Germain-en-Laye. This is right next to the RER (fast metro) station and in the centre of town. It will last about 2 hours including interval. - The venue is quite small (110 seats) so please reserve as soon as you can to ensure availability. Having said this we will not be publicising the event locally for another few weeks so there is time. - Various bars are within 100 yards of the venue. - Places will cost £18 (children or students £15) and can be reserved by sending a cheque to the order of Oliver Ash to: Oliver Ash, 30 rue de Pontoise, 78100 St Germain en Laye. Please also send me an email to oash@richmond-dev.com so I can confirm to you when your cheque has been received and your place is booked definitively. - This is not designed to be a profitable venture, merely to try and keep any loss to a minimum, so apologies if you think the price appears steep. - The town is close to Paris, which is easily accessible by RER (20 minutes to Arc de Triomphe - Etoile) as above. However it is a delightful town for a weekend in its own right and there are a few local hotels. We are trying to reserve a few rooms on this basis and at an attractive rate at Ermitage des Loges, within 5 minutes’ walk of the venue. It is a pleasant hotel where the rooms are likely to cost about 90€ for a double. Please feel free to look on the internet for hotels or watch this space for booking arrangements at Ermitage. - Please email me if you have any questions relating to arrangements or contact the esteemed co-organiser Ian Chippett. - I will update info on the forum from time to time. Dear Oliver, please reserve two places for the memsahib and moi. I have sent you an e-mail re payment. Looking forward to it. Excellent news, well done. Have requested 2 tickets, can't wait! - the hotel mentioned above, Ermitage des Loges, 00 33 1 39 21 50 90, has agreed to hold back 6 rooms until end March; price is 80€ single and 90€ double, ex breakfast. Please contact them directly if you want to book, they will take a credit card guarantee but refund you if you have to cancel at 48 hours notice I believe. It's very convenient for the venue and St Germain en Laye as a whole. - er...that's it so far. The hotel Ermitage des Loges has said they will block a further two rooms until 12 March. 4 of you have already booked so if any others wish to do so please don't wait too long or all the rooms might have gone. Please call them to book as the internet reservations may show no availability. The rooms are booked under 'Pete Atkin'. Nothing else to add at this stage other than we are near the 40 mark for tickets and the excitement - at least in our household - is mounting! For any hesitant Voices we can still get the Stade de France if you book soon enough. Plus it's closer to where I live. Latest report indicates close on 50 tickets already sold for the concert, out of 110 or so. And the posters have just been printed! Latest news from the front near Paris. Thanks to a tremendous effort from my sales team (alias Mrs Ash) we have now breached the 70 mark and there are only about 30 tickets left. A big atmosphere is therefore already guaranteed for the concert. As far as events are concerned Ian Chippett has dreamed up the idea of a MV quiz, and we actively encourage an informal play-as-you picnic music session from the stone steps at the back of the garden. I will provide an acoustic guitar to keen musicians but reserve the right to whip it back if the results are not satisfactory and the neighbours complain..."
Please encourage any late-comers to join you for the event before it's too late. Look forward to seeing MVs on the 26th. Please also contact me if you have any questions or if I've left something vital out of the arrangements. We're looking forward to a memorable evening and weekend. It is, indeed a small world. After a train ride from Sheffield, Yvonne and me boarded the Eurostar for Paris. 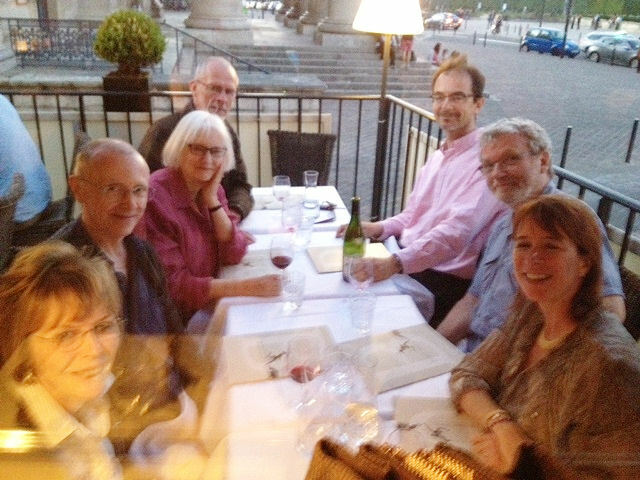 We shared a table with a young French guy and a bearded gent who claimed to be from the USA but clearly wasn't. After an hour or so a few words he spoke clicked in my brain and I deduced that he was none other than Keith Busby, PA fan from Madison, Wisconsin. This was great good fortune as we speak no French and he teaches it to graduates. So our trip from the Eurostar terminal to St-Germaine en Laye was Teflon smooth. I returned his translation favours by using my acute geographical skills, honed by hours on Google Streetview, to guide us to the hotel. Keith had arranged to meet up with Robb and his wife for dinner, so we all ended up in a nice Moroccan place where vast amounts of humous were washed down acceptable wines. We have now staggered back to the hotel, refraining from knocking on Oliver Ash's door and asking for a nightcap out of consideration for him needing his sleep before the big day. We are truly noble creatures. The venue looks magnificent. The weather is appallingly warm (I'm Scottish so this is like exploring the rain forests to me) but there is keen anticipation of the day to come.